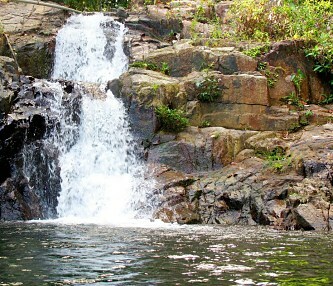 Anambas has 3 main waterfalls on offer, each unique in its own breathtaking way. Tip: Bring your camera! 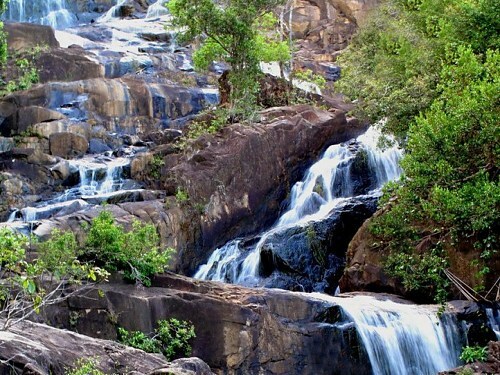 Anambas has no fewer than three waterfalls on offer: Neraja, Air Bunyi and Temburun. The Bahasa term for waterfall is "Air Terjun", which means "plunging water". Air Terjun Neraja is located in mountains terrain, near Ulu Mares Village, in the Eastern District of Jemaja. The scenery here in lush and peaceful. In fact, once you're here, the sense of mystique of the place is almost palpable, very worthy of a visit. Air Terjun Bunyi meanwhile, can be found near Air Bini Hulu Village, in the Siantan Southern District. This waterfall, in spite of its 8 meter high drop, is almost completely hidden from sight, sequestered as it is by dense jungle. The pond below, whilst clear as glass, is a delicate green color and almost irresistible as far as refreshing dips go. Air Terjun Temburun is surely Anambas Archipelago's waterfall pièce de résistance. Standing a magnificent 250 meters high, Temburun's relentless flow cascades down a total of seven separate levels before tumbling directly into the swirling sea below - a spectacular sight!